We know when we experience it, but have you ever wondered why we feel pain, or what its purpose might be? These are the questions Harvard-trained physician and pain specialist, Dr. Aneesh Singla, seeks to answer in Why it Hurts. His insightful look into the pain experience will make you rethink your understanding of the feeling, make you question your resilience and reconsider how pain is responded to around the world. A thought provoking read, not only for chronic sufferers, but also for those with a desire for a greater understanding of their bodies. With over a decade worth of experience within the pain management sector, Dr. Singla offers an educated, intellectual and discerning opinion on our response to pain and how to best deal with it. Learn about how pain is treated from a historical perspective in medicine and how our response to it has changed over time. Discover how changing your thought process can help the way you manage pain, and even transform it into a transformative experience. Challenge your views about pain management, and the potential effects America’s opioid crisis can have on the world. Not all pain can be cured. The key is in the balance between the “cure all” culture, and the real need to manage the astounding number of Americans suffering chronic pain. By understanding why our bodies behave the way they do, we can have more empathy and release perceived notions about how we feel about ourselves and our responses. Pain is a feeling triggered in the nervous system. The perception of it is highly individual and depends on a lot of factors. As much as we’d hate to admit it, we need pain. Our bodies use it to say, "Hey! Something's wrong here!" Your throbbing jaw tells you to go the dentist where he discovers and pulls an infected tooth. Just because there is no definitive cure for the cold, doesn’t mean your body has to take forever to get rid of the virus and recover. If you recognize that you have the flu early enough. 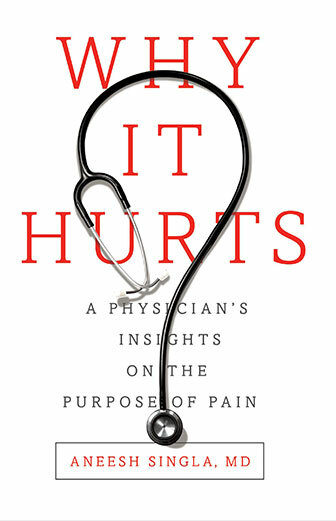 What inspired you to write Why It Hurts: A Physician's Insights on the Purpose of Pain? As a practicing pain specialist, I often get questions from my patients on the topic of pain. People often have basic questions like "Why does pain have to hurt so much?" or "Why does it have to hurt for so long after my injury?" When you hear the same questions from different patients over time, you start to realize that there are many people who have questions about pain, and the book was a response to that. I wanted to share some of my knowledge on WHY pain hurts. Chapter 1 of the book really introduces pain to the reader as a sophisticated alarm system in our bodies to help us adapt to danger in our surroundings. In your book, you state that pain is important to human beings in our survival as a species. Can you elaborate? Absolutely. In Chapter 2, I talk about children that are born without the ability to feel pain. There are other conditions, like diabetes, which also result in our inability to sense pain. Along with this lack of pain, comes injuries to our bodies, which we can’t always prevent because we can’t sense the pain when we sustain the injury. If you think of pain like I do as a sophisticated smoke alarm consider that if your home smoke alarm was broken, you might not know there was a fire in your house. In Chapter 3, you talk about how psychological pain is real pain. Can you tell us more about this? Sometimes people dismiss psychological pain, and consider physical pain to be more of a "real" pain. But there is evidence that psychological pain is "felt" in some of the same areas of our brain as physical pain is. People who have lived through intense physical pain and psychological pain in many cases will report that the psychological pain was far worse than the physical pain. Psychological pain is often described as that "gut-wrenching" sensation we get when we have psychological distress. You mention in your book that pain is a transformative event in our lives. How so? In Why It Hurts, I share some real stories of my patients that experienced positive transformation as a result of their pain. I think we can all learn from painful events in our lives. There is a message in these events, and once we learn to use these as a tool for growth, we get better at living life. Pain becomes an opportunity, and not just an inconvenience. In the book, you talk about real life heroes, mythological heroes, and pain. Can you elaborate? According to psychologist Carl Jung, myth is a manifestation of our collective unconscious. We create myths to work through our struggles in life, which may serve as a sophisticated coping mechanism. If you look at heroes in myth, their journey is often a road paved with painful events that are transformative. For example, I really love Game of Thrones, and in my book I talk about painful transformations of two of the characters, Jon Snow and Daenerys Targaryen. I also compare them to two real-life heroes, Nelson Mandela and Oprah Winfrey. I try to point out some similarities with regards to painful transformations between the fictional and real-life heroes. Can you help us better understand resilience, and how it plays into the concept of pain? I believe resilience is how we meet with adversity or pain in our lives. If we believe that pain helps us and a life without pain would be a disadvantage, then we have to try and meet pain with an attitude of resilience. The Navy SEALs are a great example of this, through their motto, "The Only Easy Day Was Yesterday". With Dr. Singla's book, your next easy day could be tomorrow! Read it! If you are a patient who deals with chronic pain issues, you owe it to yourself to take the time to read this book. You'll be glad that you did. Eloquently transforms complex pain concepts into a page turner. 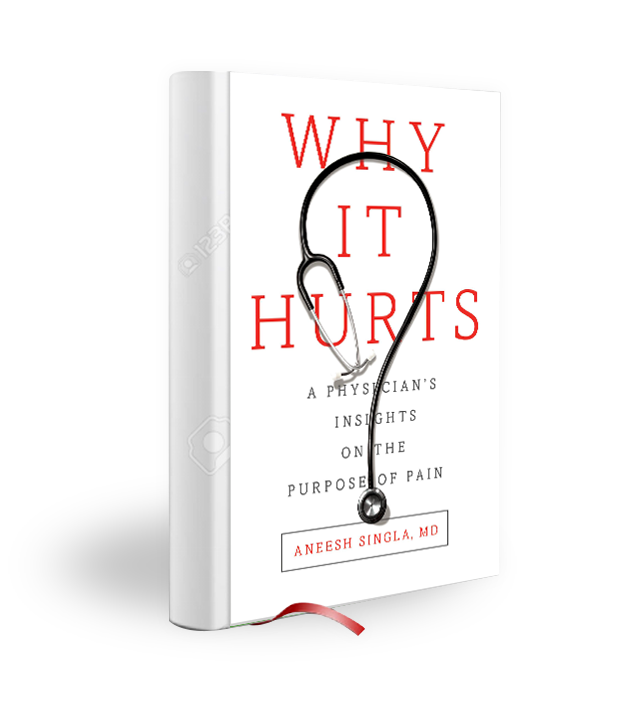 The author of Why It Hurts, Dr. Aneesh Singla, is a recognized leader in the field of pain management. With over a decade of experience as a pain specialist, he is a sought after public health expert for media appearances, has contributed widely to, and been published in, many respected medical journals, and he also serves on the physician faculty at Harvard Medical School. Born in New Jersey, he grew up in North Carolina, where he attended both University and Medical school, graduating with honors. He later obtained a Masters in Public Health and completed a residency at Massachusetts General Hospital and two fellowships – at Brigham and Women's Hospital in Interventional Pain Management and at Harvard/Partners Institute for Health Policy in Patient Safety. He currently lives in Maryland with his wife and daughter, where his practice is focused on minimally invasive options for the treatment of chronic pain.